Wahoo! That is one beautiful baby. So happy for you guys. Congratulations!! I bet it was so exciting to see the heartbeat! Yay!!! So excited for you, Amanda! What a sweet little blessing! Great news! The u/s is a huge hurdle in my mind since everything went sour at that point last time. I'm glad you got through it without any issues! Congratulations! Wow, beyond excited for you!!!!!! Even got a little teary-eyed. :) Congrats! Oh this is wonderful news and I'm SO happy for you.....I just wanna cry!! Such great news! So excited for you! Lots of prayers coming your way on that sweet little blessing. Isn't it sweet music to your ears hearing that lil beat-a-beat!!! Congrats on a wonderful US...HUGE step!!! So excited for you! Seeing and hearing the heartbeat for the first time is absolutely the best!!! Woooohoooooo! Yay! That is wonderful news. So very, very happy for you! H&H 9! Amazing news!! So excited for you!! this is the best news. there is nothing better than to see you own baby with it's little heart beating. God is just the best! Both my hubby and I have been praying for you each day. I would take all the u/s you can get. I love them. So So So happy for all three of you. Prayers coming your way!!! :) Praise God for this news! : ) So, so happy for you! I've enjoyed keeping up on all your posts recently. Will continue to keep you in my thoughts and prayers. I think the icing on the cake in all this is DEFINITELY missing tax season. WahHOO!!! And congrats on the promotion! Holy cow! Lots of big news in your world!! You deserve it all! Congratulations!! 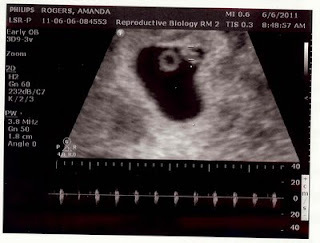 So happy you had a good first ultrasound. Ooh, I've got goosebumps! I am so thrilled for you!!! Woo hoo!!!! So, SO thrilled! Thought about you all day yesterday!! Perinatologist = WIN. Extra ultrasounds! (if you need a great one, E-mail me...BC connection and he's awesome) Planned C-section, also a win, in my opinion. Bring it on. So freaking excited. Praying every day for Baby Rogers! I'm already in love with that litle heartbeat!! Congratulations! What a wonderful sight...and to hear a heartbeat...bliss for you and hubby I'm sure. Still sending hugs and prayers your way. God bless you, hubby and your little bun in the oven xo. Great news!! So exciting to see and hear the heartbeat! In two weeks gummy will look totally different - it's insane how quickly they grow. Congrats on the promotion! All these wonderful things happening all at once. sending love and prayers... this is such wonderful, wonderful news! yay yay yay!!!!! what a sweet sound that is! Although we've never had so much as a conversation, I have been reading your blog for some time and have followed your struggles. Because of that, I have to admit that these images brought tears to my eyes. I am so sincerely happy for you. Can't wait to hear all about your pregnancy adventures! Congratulations to you and your husband.